Grade A Amber Color with Rich Taste is full-bodied in flavor and a good choice for those who prefer the classic maple syrup flavor. Compares well to the former Vermont Grade A Medium Amber. This syrup is so flavorful and delicious! I'll definitely be buying again and the glass maple leaf bottle is beautiful. 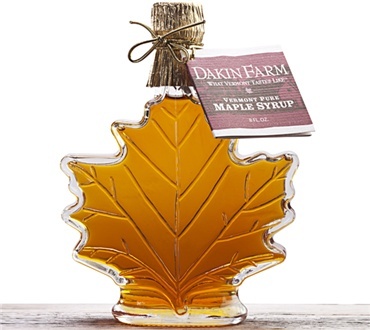 Been using Maple Syrup purchased at Dakin Farms for several years. Decided to get a nice dispenser for the table. Glass Maple leaf is awesome!